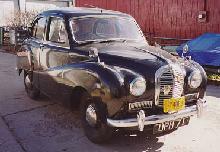 In 1952 Austin launched a facelift A40 to replace the ageing Devon which first appeared in 1947, the new car was named the A40 Somerset, carrying on with the counties name theme. The new Somerset was really little more than a restyled Devon, albeit with slightly more power coming from the same A40 1200cc engine. The Somerset shared its curvy, transatlantic body shape with the much larger A70 Hereford, both cars looked visually pleasing and well proportioned. 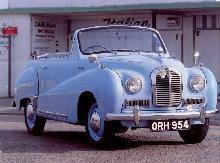 Eight months after the saloon appeared, Austin launched an elegant Somerset 3 position, Convertible which sold in relatively small numbers. 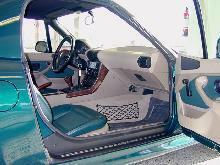 Inside the Somerset had a steering column change, front bench seat and an umbrella handbrake lever, all adding to the American theme. 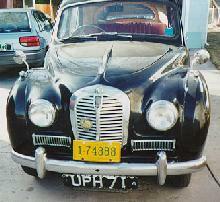 Austin also introduced a slightly souped up version of the somerset in 1953. 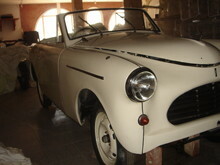 It had better accelaration, two tone body colours and an upgraded interior but this car was sold in very small numbers. 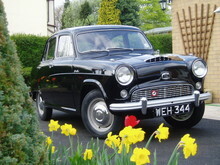 Despite the Somerset's leisurely performance it managed to sell well during its short production run, which ended in 1954 with the launch of the all new A40 Cambridge.